Working with a small, scrappy startup team, I often find myself wishing for more brains on deck to work on cool projects, build more shiny features, and talk with our customers. It’s just natural to believe that larger teams means you’ll get more awesome stuff done, and so much more swiftly -- which is why I was taken aback when I learned that throwing more people at a problem is one of the most common productivity traps that you can fall into. In fact, the conventional wisdom that two heads are better than one -- or the more brains you have on a problem the better -- is completely wrong. People in smaller teams are far more personally productive. More people means more of everything -- more good to great, and more bad and ugly -- in rallying a group of human beings to get something done. Even if more people provide a greater pool of resources, they also require greater amounts of coordination and management, to the point where size becomes an impediment. To contrast, consider groups like the Finnish games company, Supercell, composed of only about 100 employees but making $2.5 million a day, with two “top grossing games ... built and launched in six months by teams of five and six people.” That magic number for the most effective teams varies, falling anywhere between four to nine, and more often six or seven. A classic study by Bibb Latan? 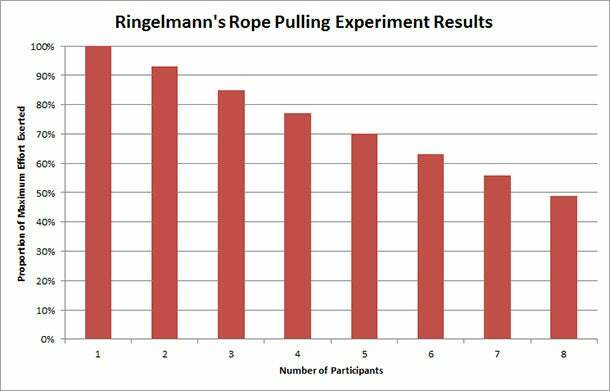 demonstrated the social loafing effect with groups as small as two to six. Participants wearing blindfolds and noise-masking headphones had to shout as loud as they could. Everyone made less noise in groups compared to when they shouted alone. While the total sound produced was louder, it didn’t grow in proportion with the group size. People in teams of six shouted at 36% of their full individual capacity. When researchers controlled for any possible coordination loss by having participants shout in pseudogroups -- fake groups where participants believed they were shouting in concert when they were actually shouting alone -- people still didn’t perform at full capacity, producing 74% of their full potential sound. Relational loss is when you feel as if you are receiving less and less support as teams get larger. This includes emotional support, assistance in performing work and overcoming setbacks, and informational support to help solve problems. Think about your worst workdays -- and how much harder it is without a shoulder to lean on or someone to help you out of a jam. Studying 212 knowledge workers throughout multiple companies in teams ranging in size from three to nineteen, Mueller analyzed data derived from performance evaluations, given by both peers and team leaders, as well as questionnaires on motivation, connectedness, and coordination. She found, as she says, “compelling evidence for relational loss -- it loomed larger than you might expect given how much emphasis is given to coordination.” People’s perception of support decreased as team size increased and this relational loss accounted for poorer individual performance. Be adventurous, explore your office or virtual watercooler, and find new ways to connect, likeZappos’s “face game” (upon logging into the computer system, you guess the name of a coworker whose face pops up and then see his or her bio). Ask questions, show your teammates gratitude and appreciation, and respond to distress signals. Creating a high frequency feedback culture, like the one at Zapier -- where there are daily discussions on what everyone gets done and monthly one-on-ones -- helps everyone be better at their jobs.